The earliest artiodactyls appeared in the early Eocene, probably evolving from ancestors in a group of Cretaceous and Paleocene mammals collectively known as condylarths. 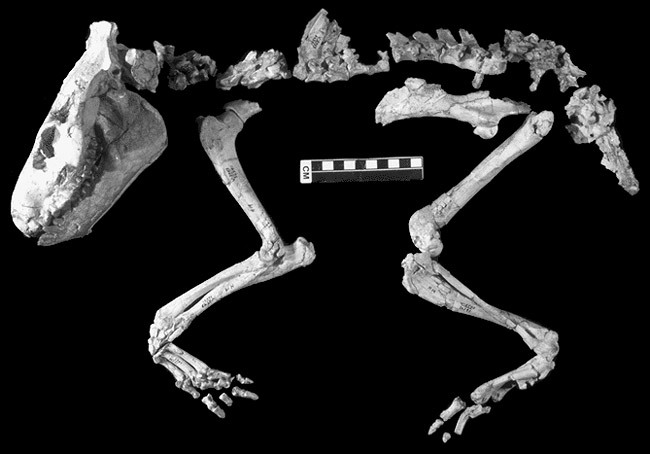 The oldest known true artiodactyl, Diacodexis, was about the size of a rabbit. By the close of the Eocene, the artiodactyls had radiated into a number of families, including the first camels as well as a number of extinct families. The oreodonts, sheep-like artiodactyls from the Eocene and Oligocene, were among these early artiodactyls. 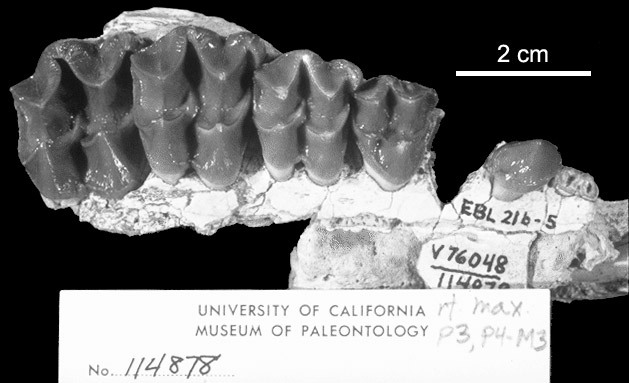 Two oreodont fossils are pictured at left  click either to see an enlargement. Artiodactyl evolution continued in the Oligocene, when the oldest pigs and peccaries appear in the fossil record. However, it was the Miocene, beginning about 15 million years ago, that saw the greatest radiation of artiodactyls. Due to widespread cooling and drying of the climate, much of the Earth's forest habitats were replaced by grasslands. Ruminant artiodactyls, with their specialized digestive systems able to digest tough plant material, were well adapted to move into these new habitats. The oldest relatives of today's deer, cows and bison, antelopes, and pronghorns all appeared in the Miocene, while most of the families of small artiodactyls that had appeared in the Eocene disappeared at about this time. One of the largest and most impressive artiodactyls of the Pleistocene was Megaloceros, the somewhat misnamed "Irish elk" whose skull and antlers are pictured at right. What was so special about it? Check out our "Case of the Irish Elk" page to find out.